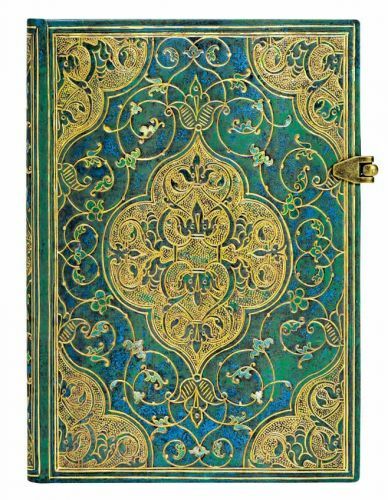 Let a swirl of turquoise amid gilt embellishment inspire you to write your chronicles. This cover design is based on a binding originally published by Salel Binder in Paris in 1514. The tome, Chroniques, was created at a time when books were evolving and binders were using smaller formats that were easier to bind. Pasteboards replaced wood covers and gold tooling grew in popularity. The exuberance of the Chroniques design reflects the sheer splendour of the Renaissance approach to decoration that influenced architecture, art and all facets of cultural life. In the glittering aqua green- blue of this cover you may well see the intricacies of your own stories or the infinite possibilities of the written word. At the very least, we hope that Turquoise Chronicles will make you think of Paris, which has for centuries been a centre for art and publishing and a beacon of culture.